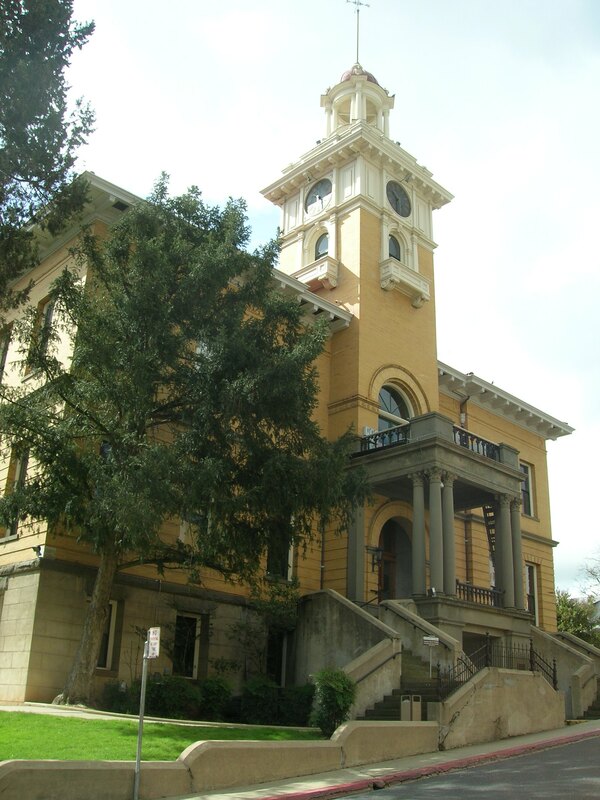 Historic Courthouse at 41 W. Yaney Avenue, Sonora, CA. Entering Sonora on Hwy. 108 from the bypass exit, Hwy. 108 becomes Stockton Road. At the stop-light, turn left onto Washington Street. Travel to West Yaney Avenue and turn left. One block and to the right is the Francisco Building, that pro- vides two levels of covered parking. The second level parking area is restricted to county vehicles only. The Historic Courthouse (housing Departments 1, 2 and 5) is to the left at the corner of West Yaney Avenue and Green Street. Entering Sonora on Hwy. 49 from Calaveras County, Hwy 49 becomes Washington Street. Travel to West Yaney Avenue and turn right. One block and to the right is the Francisco Building, that provides two levels of covered parking. The second level parking area is restricted to county vehicles only. Please take into consideration that there is limited parking available downtown, and arrange your driving time accordingly. Entering Sonora on Highway 108 from the bypass exit, Highway 108 becomes Stockton Road. At the stoplight turn left onto Washington Street. The Branch Location (housing Departments 3 and 4) is on the left between West Yaney Avenue and Dodge Street. Turn left on West Yaney Avenue. One block and to the right is the Francisco Building. You may park in the first level parking area. The second level parking area is restricted to county vehicles only. Entering Sonora on Hwy. 49 from Calaveras County, Hwy. 49 becomes Washington Street. The Branch Location (housing Departments 3 and 4) is on the right between Dodge Street and West Yaney Avenue. Turn right on West Yaney Avenue. One block and to the right is the Francisco Building. You may park in the first level parking area. The second level parking area is restricted to county vehicles only. A drop-box is maintained on the first floor for filings received after 3:00 p.m. Filings received between 3:00 and 5:00 p.m. will be filed-stamped as of the date they were received. Access is available for persons with a disability. There are three floors, and no elevator. Please call (209) 533-6565 in advance to make arrange-ments for special accommodations. Types of cases handled at this location are: Civil, Family, Probate, and Juvenile, as well as criminal hearings and trials. A drop-box is maintained in the lobby for filings received after 3:00 p.m. Filings received between 3:00 and 5:00 p.m. will be filed-stamped as of the date they were received. Access is available for persons with a disability. Please call (209) 533-6565 in advance to make arrangements for special accommodations.